Stromboli is one of the eight Aeolian Islands. Together they form a volcanic archipelago in the Tyrrhenian Sea that arcs across the Mediterranean from Mount Etna over Lipari to Mount Vesuvius. Located off the north coast of Sicily, they are named after Aeolus, the ruler of the winds in Greek mythology who lived on the mysterious floating island of Aeolia, where Odysseus was a guest in the Odyssey. The volcanic origin of the islands is the result of plate tectonics: for 260,000 years, the African continental shelf pressed towards Europe, forming ruptures through which magmatic outbursts appear. 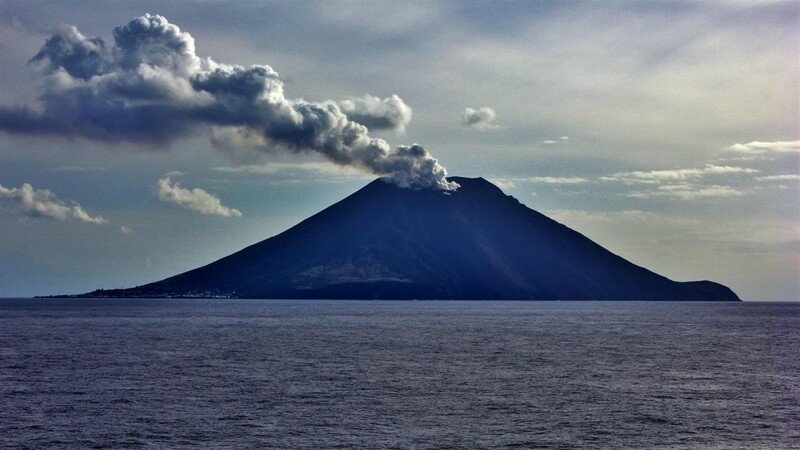 The island of Stromboli is the product of a series of these outbursts over the last 13,000 years, whereas the present-day eruptive vents are located at the top of the Sciara del Fuoco, or Stream of Fire. It has given its name to Strombolianeruptions: mild, energetic outbursts that throw pieces of potassium-rich basalticandesitic lava, smoke and noise into the air. Together with occasional lava flows, a steepsided cone is continuously reshaped and formed. Like a pyramid of natal earth, the Lighthouse of the Mediterranean rises out of the sea. Loosely populated in three villages, the island achieved popular recognition with Roberto Rossellini’s neorealist drama Stromboli, terra di dio (1950), featuring Ingrid Bergman. Together with Strombolicchio, a nearby remnant of the island’s volcanic origins, it continues to attract visitors, fascinated by its isolated fusion of the elements, its explosive turning of the earth’s fluid interior into hardened matter, while the sun disperses the watery horizon into clouds.